The man who believes he can do something is probably right, and so is the man who believes he can't. Lemon, Orange, Eucalyptus radiata, Spearmint, Cypress, Fir, Ravensara, Tea Tree. Mandarin Pure Essential Oil (Citrus reticulata, cold pressed). The Value of Essential Oils in Promoting Good Health Aromatherapy is becoming increasingly recognized as a valuable way to promote both physical and emotional health. 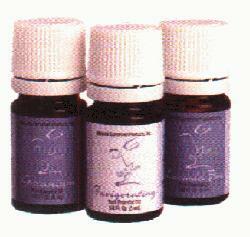 The following will introduce some of the benefits of essential oils (EO's). As the molecules which make up an essential oilmake contact with the olfactory nerves there is a distinct neurochemical response that takes place in the brain. This response almost always results in an immediate memory reflex throughout the body, which is usually felt most strongly in the solar plexus. This solar plexus response will usually be either a relaxed, calm, settled sensation or a tense, uptight, squeezing feeling. This is the first indicator of whether a particular essential oil or aromatherapy blend is compatible with the body (and the emotions) at that point in time. Tension indicates the oil is having a negative impact, while relaxation suggests a positive one. The smell and taste approach to determining which EO's to use or recommend is also quite effective. In aromatherapy the premise is: "If it smells or tastes good to someone that person's body needs it. If it smells or tastes bad then the body doesn't need it.” The body is designed so that generally bad aroma and taste is a warning-stay away. Pleasant fragrances are usually associated with influences which are vitalizing and replenishing and have positive influences on the body and nerves. Likewise, decay and petrifacation give off foul odors, warning us to "stay away”. Massage: Mix approximately 7-15 drops of essential oil with one tablespoon of Massage Oil and apply amount desired for massage. Diffusion: Place 10-25 drops of undiluted essential oil in diffuser. Cooling: Add 1 tablespoon Aloe Vera Gel to 7-15 drops of a "cooling" essential oil like lavender. Mix well. Compress: Add 4-6 drops of essential oil to a bowl of hot or cold water. Soak small towel and squeeze out excess water. Apply to affected area. Bath: Draw bath, then add 10 drops of essential oil. Agitate water in a figure-eight motion. If desired, add 1 teaspoon Nature's Sunshine Concentrate as water is running. Soak for 15 minutes. Try a sitz bath with just enough water to cover lower body and add 5 drops of essential oil. Shower: Put 1-2 drops of essential oil on a washcloth and rub body with it while showering. Inhalation: Place 6-8 drops of essential oil in a bowl of hot water. Place a towel over your head, lean over bowl and inhale for five minutes. Be careful not to let essential oil irritate eyes. You may also inhale oils directly from the bottle. Vaporization: Add 10-20 drops of undiluted essential oil to the water unit of a vaporizer or humidifier. Gargles and Mouthwashes: Add 3 drops of essential oil to 1 teaspoon of water, mix and gargle. Hot tub: Add 10 drops of essential oil to water. Household: Add a few drops of essential oil to a dishwasher or washing machine to promote hygiene and aroma freshness. For general household use, add 10 drops to a bucket of warm water. If desired, add Nature's Sunshine Concentrate.